The ease of use of man / machine interaction made possible with VuePoint III gives new meaning to the term “user-friendly.” The unit is a drop-in replacement for legacy VuePoint II customers who desire a technology upgrade. The VuePoint III integrates a color 10.4" (diagonal) LCD display, which replaces the gas plasma display of previous generation VuePoint models. 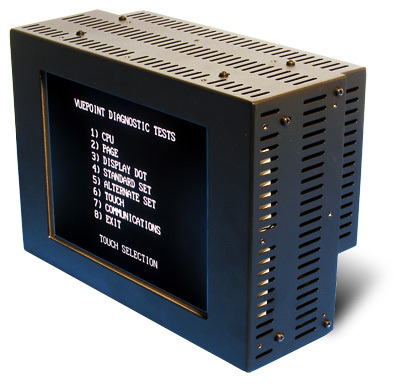 The 640 x 480 pixel LCD screen is configured to emulate the VuePoint II 12 x 40 screen. The end user has control of setting up the text and background color of the screen. We qualify multiple sources of supply to ensure product availability and long life. The VuePoint III responds instantly to the touch of the finger or other stylus. Simple, menu-prompted, touch-interactive operation makes even the untrained operator instantly productive, and further enhances the trained operator’s capabilities. For applications where time or timing are critical, touch entry improves a user’s response rate by reducing reaction time. No complicated keyboard, mouse or pointing device operations are required with VuePoint III. As a serial terminal, the touch screen can be configured for RS-232, RS-422 and RS-485 communication. The touch screen also serves as a protective glass overlay. In lieu of the sealing tray used on VuePoint II, the touch screen is installed in the enclosure using a dust and water resistant gasket to protect the internal electronics. The VuePoint III incorporates a rugged aluminum enclosure and is designed to withstand the rigors of commercial, industrial, and military (COTS) environments alike. 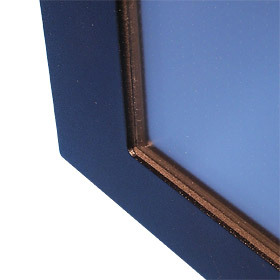 The enclosure has an irridite coating (conductive anodized) to provide protection from corrosion and improve shielding properties where parts make contact with one another, and is finished with a durable black powder coat. Our products are intentionally designed to support LCD displays (and other electronics) from numerous manufacturers. This capability enables us to minimize the impact of a single suppliers decision to obsolete, allocate or redesign their display, upon our ability to maintain configuration control or extend the manufacture life of our products. 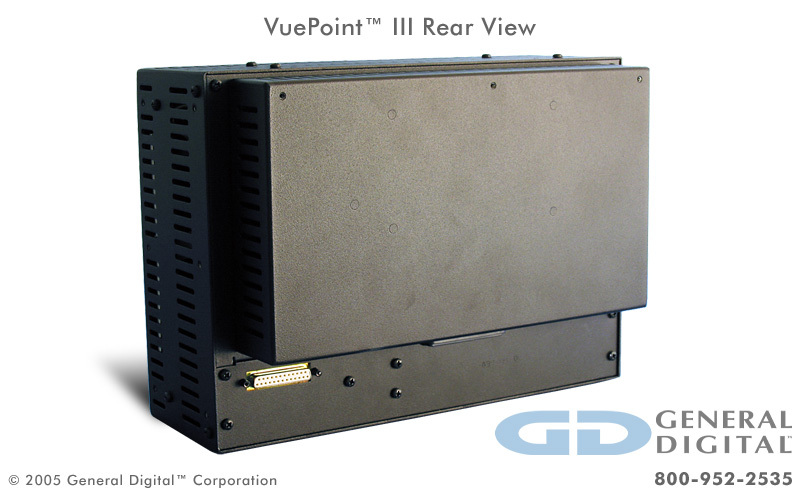 The VuePoint III is normally delivered as a standalone unit, and is optionally available in panel mount and rack mount configurations. 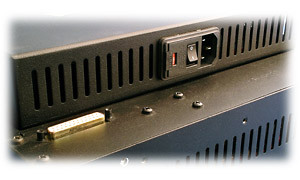 The VuePoint III comes standard with a power supply mounted to the rear of the enclosure, which uses less than 25 watts. To maintain a minimum depth in your application, VuePoint III can be ordered with a separate power supply. We at General Digital are completely responsible for the design and manufacturing of our products, allowing us to maintain nearly total control of their future. General Digital gladly offers its engineering services to customers who require special customization of our devices to meet their commercial, industrial or military requirements. Our experience supporting Department of Defense programs has taught us the value of designing products with foresight so that they can be manufactured, serviced and upgraded for many years. Though the market introduces new innovations and product upgrades at an alarming rate, our product management team knows the importance of proactive customer notification and can offer product adaptation with similar or equivalent performance before designs become obsolete, thereby extending the product life cycle. 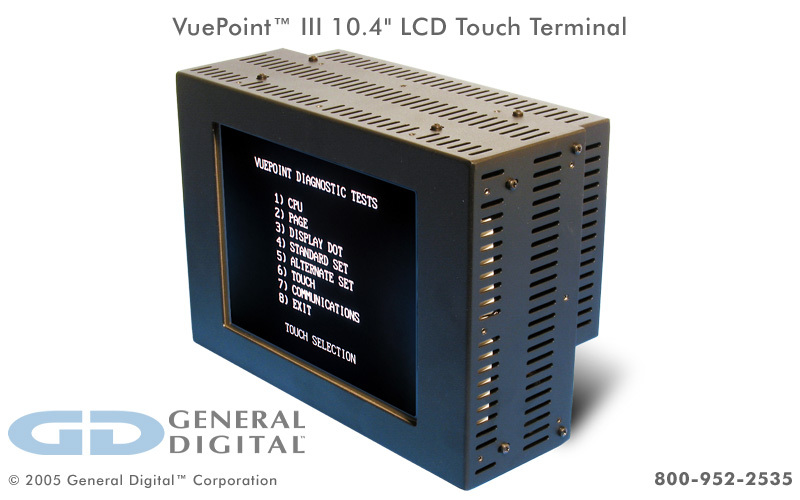 The photos below represent a small sampling of General Digital’s VuePoint III LCD terminal products. They serve to illustrate the many display sizes and mechanical configurations we offer, as well as standard and custom design features, capabilities and options. Click the thumbnails to view full-size photos.